The Stone Circle, by Anthony Tuck, is a compelling young adult fantasy novel in the same vein as works by Madeleine L’Engle or C.S. Lewis. Sixth grader Maisie Tuck and her twin brother Jasper are remarkable in several ways. For one, they have been raised by archaeologist parents in a childhood steeped in myth and history. For another, as far back as they can remember they have always been able to hear each other’s thoughts. Now, with their parents working in England, they have been left in the care of the eccentric and affable Professor Winslop. Sequestered in rural New Hampshire, Maisie does her best to tolerate Winslop’s endless tutoring by escaping with her brother to explore the woods. But these are no ordinary woods, and they soon encounter frightening creatures and a Stonehenge-like monument that holds a power they could never have imagined. And when they confide their discoveries in Professor Winslop, he reveals to them their ultimate destiny – a revelation that will plunge them into a world where myths are real, and where Maisie and Jasper are the only thing standing in the way of dark and secretive forces plotting to end existence as we know it. 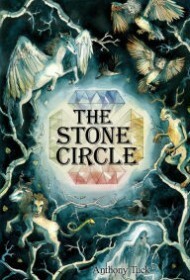 Tuck’s command of mythology is compelling and in The Stone Circle it is rendered as accessible as it is exciting. There is a sense of the familiar (Pegasus, Beowulf), but also more obscure figures (Boreas, Orithya, etc.). And it is empowering that the twins must rely almost exclusively on their own ingenuity to complete their quest. The Stone Circle is a basic story, simply told (don’t expect flashy stylistics, or clever dialogue), but it never insults the reader’s intelligence. Featuring a strong young female protagonist, it is equally appropriate for a precocious pre-teen as for a young adult. This enchanting story is especially likely to captivate young readers already interested in mythology.